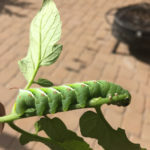 Here are some pictures of a tomato hornworm found on our tomato plants. We had never seen one before today. These “loopers” are much more common. I’m just glad it wasn’t one of these bad boys!